Wider is not safer. 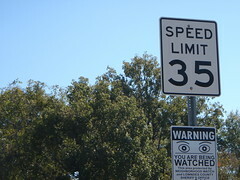 Wider encourages drivers to go faster, which causes more accidents. On a highway, where the point is to go faster, wider is a good idea. In a neighborhood such as Quarterman Road with small children catching the schoolbus, teenagers visiting among themselves, bicyclists, farm equipment, dogs, and horses, faster is less safe, and wider is less safe. "Over approximately the last 60 years, the design of streets has gone from those designed to accommodate a mix of transportation options, to that designed to carry the maximum number of automobiles as fast as possible. However, not all street types serve the same purposes. Highways, freeways and the Interstate Highway System are designed for the sole purpose of maximizing the speed of travel and convenience of automobile use. Residential design must be different to accommodate the character of the street. Unfortunately, streets in residential neighborhoods are now being designed using similar standards, yielding a situation that is not only inconvenient and inefficient, but also very dangerous. Streets must be designed to maximize overall safety. "Municipal decision makers need to take responsibility for the overall safety of the streets in their community. According to the House Committee on Public Works (U.S. Congress) (as found in A Policy on Geometric Design of Highways and Streets: 2001 by AASHTO):"
That last quote is from AASHTO, explaining what the U.S. Congress has said. I understand county engineers are concerned about not risking their certifications and county commissioners are concerned about personal and county liability. They all need to take into account that Quarterman Road is not a highway. 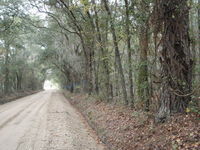 It is a local rural road with many neighborhood characteristics and people and animals and equipment to keep safe. In such an environment slower is safer, and narrower is safer. Regarding the tree canopies on Quarterman Road, the commission has decided to preserve them by making the road design narrower. Thanks to the commission for that, which not only saves the trees, it also makes the road safer. Since the county has thus already changed the road design that was submitted to contractors, I will refer to that as the old road design. Please keep the roadbed under the northern canopy straight and eliminate the gradual entrance and exit curves of the old road design. That will preserve the entire canopy, and will build in a slow speed limit. Collaborative and interdisciplinary approaches to decision-making. Understanding of the aesthetic and other contexts within which transportation occurs. Consideration of human and natural environmental effects of transportation. Selection of design criteria appropriate to a specific project’s safety, operational, and environmental needs. There is much more in the cited reference. See also 23 U.S.C. 109. The commission chair told me on the phone before the Tuesday commission meeting that he didn't believe there were any counties that implemented narrow rural local roads according to AASHTO standards. I told him that with more time I could find examples. Here are a few; I'm sure there are more. Some are probably right here in Georgia, for example in Thomas County and Glynn County. These examples are from other states, but some of them can probably be adapted. A Summary of the High Risk Rural Roads (HR3) Program for Rural Roads in Oregon, which defines what counts as risk, by accidents or traffic. Sonoma County California Circulation and Transit Subcommittee recommending explicit recognition of rural or community character roads. Massachusetts' Low Speed/Low Volume Design Standards, for non-arterial routes with a design year traffic volume of no greater than 2,000 vehicles a day, and a design speed of 40 MPH or less. These standards are for total paved width of 24.6 feet and total cleared width of 37.74 feet. They also cite an AASHTO minimum width of 29.5 paved and 49.1 cleared. Explicit design criteria for 30MPH 10 foot lane width 5 foot shoulders rural local road with level terrain by the Rocky Butte Association of San Luis Obispo County, California. That last one refers to AASHTO rural local road requirements for 10 foot traveled ways and a combination of 3 foot paved and 2 foot graded shoulders. That adds up to a total right of way width of 30 feet. There are many precedents from multiple states of AASHTO standards being adaptable to local rural roads, right down to a 30 foot right of way. Narrower is safer on a rural local road.